My husband is hoping to give up `giving up` this Lent. His tongue-in-cheek comment reflects a desire for a more positive attitude – to embrace the proverbial half-full glass rather than feeling overwhelmed by life`s challenges. Lenten fasting can be as much about embracing and sanctifying our present life and circumstance as it is about giving something up. 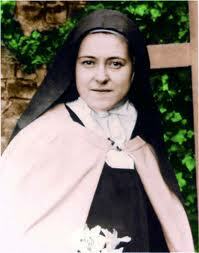 St. Thérèse of Lisieux became a saint by following her `little way`. She always wanted to be a saint, but she was not destined for the grand road of missionary work or martyrdom. She lived a quiet life in a small Carmelite convent in France. It was a quiet life, but not an easy life. Living and working with her sisters gave her multiple opportunities for sanctity each day. She struggled to remain silent when falsely accused of minor infractions. She tried to maintain a pleasant disposition with crotchety nuns. She didn`t complain when she received a smaller or inferior portion of food. She offered up each and every inconvenience and annoyance as a sacrifice. It was her `little way` – a way that led her to become one of our most popular saints. Everyday life often presents enough challenges without needing to take on extra penances. The sleep deprivation of new parents is more sacrifice than most of us can handle. Parenting at all stages poses unique stresses that easily overwhelm us. The aches and pains of illness and aging are suffering enough. Crises at work, at home, and in our world test our patience, fortitude and courage. Sometimes the best Lenten fast that we can pursue is to simply embrace the present challenges given to us with faith, hope… and an extra dose of love. As with many saints what made Theresa holy was a problem for the Church in her canonization process. The “Little Way” almost prevented Theresa from being declared a Saint. Here is how I interpret the “Little Way” and the why it may haven a problem to the Church. I have to choose, and grace has to do it, this is the “Little Way”. Choosing is not about feeling, it is about the making the right choice, by an act of your will, and the peacefully live with your imperfection. You are ready and willing to let go of sin, and you wait for grace, for God to lift it from you. The thought being that God wants you to bare with these things gracefully, and it is up to God to remove them from your life.